"It's official, the EU has outsourced its dirty work," according to Medecins Sans Frontieres (MSF) which tweeted its response to the news that Turkey has "rounded up" 1,300 asylum seekers to stop them from traveling to Europe. Indeed, just after accepting US$3.2 billion in exchange for keeping refugees in check, Turkey has detained 1,300 asylum seekers from Iran, Iraq, Afghanistan and Syria in a sweep, as they boarded a boat heading to Greece. 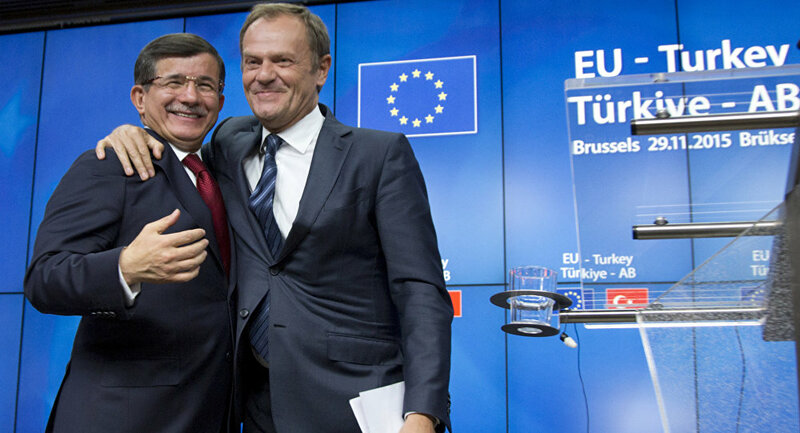 The deal between the EU and Turkey was reached when the EU agreed to hand over the money, relax visa restrictions and renew Turkey's bid to become a member of the EU. All Turkey needs to do is hold back refugees from trying to make their way to Europe. According to Turkey's state-run news agency and Associated Press, some refugees were hiding in olive groves but were rounded up and detained in a sweep in Ayvacik in Canakkale province. Then, according to Dogan news agency, they were put onto buses and taken to a small overcrowded detention center, awaiting deportation. Four boats and six motors were also seized and four suspected people smugglers arrested and detained. Ayvacik is the main hub for refugees to set sail from Turkey to the Greek island of Lesbos, where 450,000 have arrived so far this year. Conditions on the island for the people smuggled across the sea have been described as desperate, with morgues full of dead bodies of refugees who didn't make the journey and make-shift camps full while people wait to be formally processed. More than 300,000 have made the crossing from Turkey to various Greek islands, 3,000 have died trying. Turkey has agreed to crack down on people smuggling and return people who do not qualify as refugees. The deal, agreed at a special EU summit in Brussels is hoped to go some way in managing the refugee crisis in Europe where more than 850,000 asylum seekers, migrants and refugees have arrived so far. But the revelation that refugees are being "rounded up" in Turkey and detained has caused outrage from already concerned human rights groups, who have called the deal a "stain on the EU's conscience." "Ever since September, we have seen the Turkish authorities detaining scores of refugees, often completely incommunicado, and forcibly returning them to neighboring Syria and Iraq. This is illegal as it is unconscionable," Andrew Gardner, Amnesty International's Turkey researcher said. The EU has already been accused of putting borders before people in its response to the crisis as individual countries build fences and walls, washing their hands of the plight of refugees escaping to Europe. And now it seems the EU is outsourcing its "dirty work" for Turkey to carry out at a cost of US$3 billion. However, the price of the deal on the future of the European Union remains unknown.